Raise your hand if your cuticles and hands have been ravaged by dry air and sub-zero temps this winter! I picked up this pair of Orly products last month at Ulta, and they're doing a tremendous job for me. 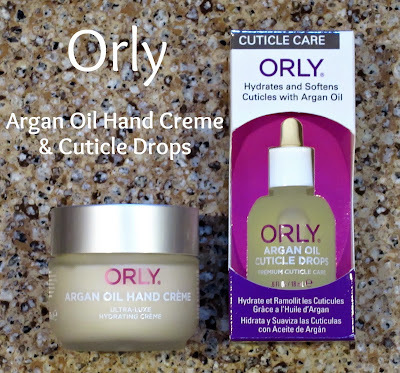 The Orly Argan Oil Hand Creme and Argan Oil Cuticle Drops have a little stronger scent than I'd like, but the citrusy aroma dries down in a relatively short time so I can live with that. 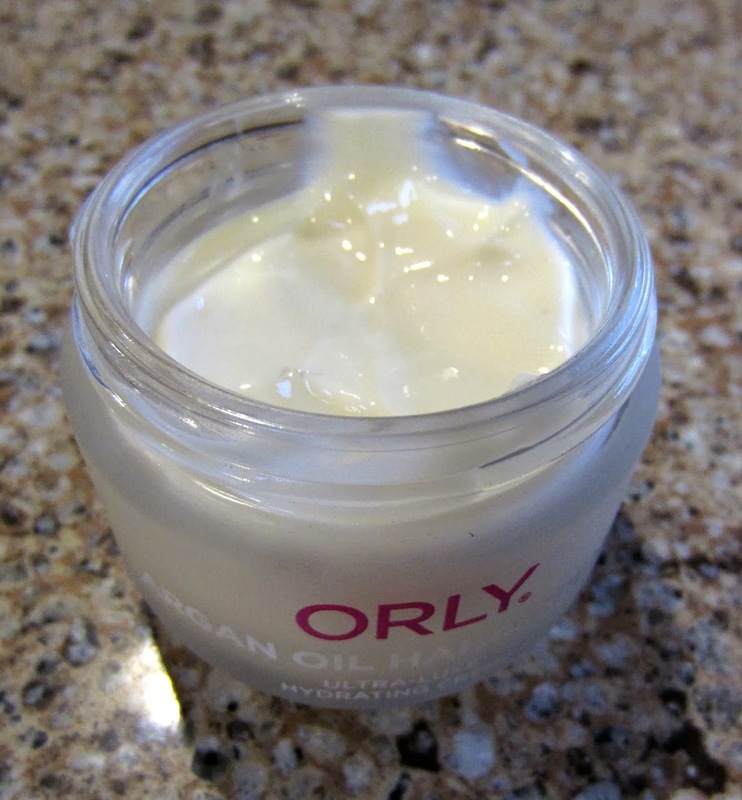 The creme is of a medium consistency that feels very luxurious and silky. It absorbs almost immediately for instant relief and soft supple skin. The cuticle drops have the same scent and they seem to absorb faster than many other drops I've used. I need less than half a drop per finger--the "little goes a long way" is definitely applicable to these drops! This pair is working wonders on my hands, and other than not being crazy about the scent, I'm very happy with both of these products. I've been adding a few drops of the cuticle oil into the creme for added protection in this crazy weather we're having, My hands just seem to drink these products up and my hands, cuticles and nails are much more nourished than they were initially. I notice quite a difference in the way my hands look and feel if I get in a hurry and forget to use these, but as soon as I apply them, they look better instantly. The products are both packaged in heavy frosted glass containers and they're priced at $15.00 (.6 fl. oz.) for the cuticle drops and $18.00 (1.7 oz.) for the hand creme. Ingredients, Hand Creme: Aqua/Water/Eau, Phenyl Trimethicone, Propanediol, Cetearyl Alcohol, Caprylic/Capric Tryglyceride, Isopentyldiol, Hydrogenated Lecithin, Cetyl Alcohol, Stearyl Alcohol, Behenyl Alcohol, Phytosterols PEG-20 Soy Sterol, Glyceryl Stearate, Sodium Stearoyl Glutamate, Argania Spinosa Kernal Oil, Simmonsia Chinensis (Jojoba) Seed Oil, Persea Gratoissima (Avacado) Oil, Butyrosperfmum parkii (shea) Butter, Citrus Limon (Lemon) Peel Oil, Squalene, Tocopherol, Batyl Alcohol, Dimethicone, Xanthan Gum, Acrylates/C10-30 Alkyl Acrylate Crosspolymer, Sodium Polyacrylate, Hydrogenated Polydecene, Trideceth-6, Parfum (fragrance), Sodium Hydrxide, Sodium Benzoate, Methylisothiazolinone, CI 19140 (Yellow 5), CI15985 (Yellow 6), Benzyl Benzoate, Citral, Geraniol, Limonene, Linalool. Ingredients, Cuticle Drops: Aqua/Water/Eau, Phenyl Trimethicone, Propanediol, Cetearyl Alcohol, Caprylic/Capric Triglyceride, Isopentyldiol, Hydrogenated Lecithin, Cetyl Alcohol, Stearyl Alcohol, Behenyl Alcohol, Phytosterols, PEG-20 Soy Sterol, Glyceryl Stearate, Sodium Stearoyl Glutamate, Argania Spinosa Kernel Oil*, Simmondsia Chinensis (Jojoba) Seed Oil*, Persea Gratissima (Avocado) Oil, Butyrospermum Parkii (Shea) Butter, Citrus Limon (Lemon) Peel Oil, Squalane, Tocopherol, Batyl Alcohol, Dimethicone, Xanthan Gum, Acrylates/C10-30 Alkyl Acrylate Crosspolymer, Sodium Polyacrylate, Hydrogenated Polydecene, Trideceth-6, Parfum (Fragrance), Sodium Hydroxide, Sodium Benzoate, Methylisothiazolinone, CI 19140 (Yellow 5), CI 15985 (Yellow 6), Benzyl Benzoate, Citral, Geraniol, Limonene, Linalool.